Having the right sheets can elevate your sleeping experience and complement your mattress for an even better night’s sleep. The crisp luxurious feel of these Egyptian cotton sheets are the perfect blend of warmth and coolness. The Malouf Egyptian cotton sheets are a perfect addition to any bedroom and are great for the sleeper who likes a satiny and durable feel. These sheets are made from handpicked Egyptian cotton. The sateen weave is created by single-ply yarns woven together to create a true 600 thread count sheet set. 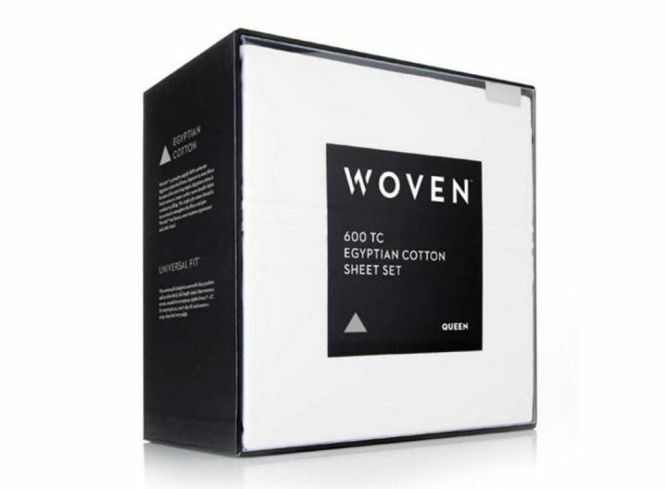 Egyptian cotton is considered superior to other cottons because the cotton fiber is extra long and creates a more durable and softer finish when woven together. They are also very breathable and help maintain the perfect feel all night long as well as resist pilling and stay smooth and soft. These sheets also give off a nice sheen and even appear luxurious because of the sateen weave. They also have a universal fit and are made to have the fitted sheet work on a mattress that is anywhere between 6″ to 22″. The fitted sheet also has a thick durable elastic band to ensure a smooth, tight fit to the mattress. The top sheet is also generous in size and will not create any reason for two people not to both get more than plenty of coverage. The pillow cases are also oversized and can easily accommodate a thicker loft pillow if needed. The Malouf Egyptian cotton sheets feel silky to the touch but also crisp and durable at the same time. They are breathable, yet create a constant and consistent comfortable temperature. These are a perfect pair of sheets for somebody who wants to elevate the feel of their mattress and really create an optimal sleeping environment. They really do bring another level of comfort to the bedroom. The quality of the materials speak for themselves and really do allow for a cool yet warm feel that keeps you relaxed all night long. These sheets are great quality and are very durable. After several months of use and several times being laundered these sheets have maintained their quality and have had no pillingand no thinning or signs of wear. They wash up beautifully and are almost softer after each wash with no color fading and hardly any wrinkles. The elastic is still strong and pulls tight and haven’t shrunk either. They have performed great time and time again and really do maintain their integrity. These Malouf Egyptian cotton sheets are about $200 and include a flat sheet, fitted sheet and two pillow cases. They are made of great materials, are very comfortable and durable too. The price for this product is well on point and well worth it. To make sure your sheets maintain their original quality it is best to care for them as the manufacturer suggests. For these sheets it is suggested to wash these sheets on a gentle cycle with a warm water wash and cold water rinse. It is recommended to use a mild non-chlorine bleach detergent and use about half the amount you would typically use. Ultimately line drying these sheets would be best but they can be dried on a low heat setting and should be shaken out before placed in the dryer. Still looking for some more information? Visit Malouf at Amazon.com. Also, have questions for us? Please contact us and we would be happy to help you!